How do you install a grid work inside a tea box so it looks like this? Here is what the lift-out grill work looks like inside the tea box. This is what the lift-out grill work looks like outside of the box. The small compartment to the left makes a chain pocket so the stop chain doesn’t get tangled with the teabags.
. Why use Venetian blinds for lift-out dividers? 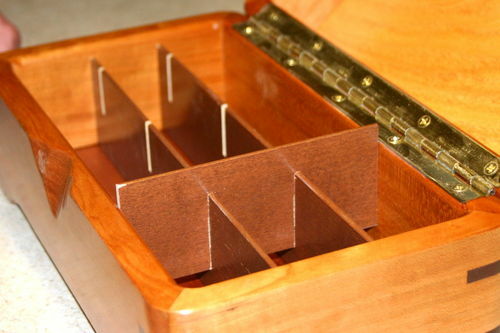 By the time you plane, sand, and finish slats to make dividers inside boxes you have a lot of time and effort invested. 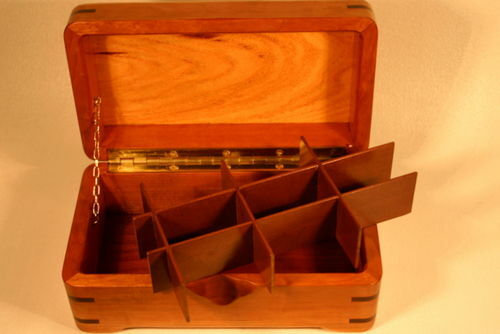 Discovering that I could make my dividers out of recycled wooden Venetian blinds took most of the drudgery out of the process of adding dividers to my jewelry and tea boxes. Please don’t use the plastic type of blinds. They are not stiff enough and are really ugly in a box. A special thanks to Josh for helping with the pictures for this tutorial. Overview: I will explain the general process in the two languages all Lumber Jocks speak: words and pictures. First, we’ll see how to build a box the right size to hold teabags, and then we’ll see how to make the grid. 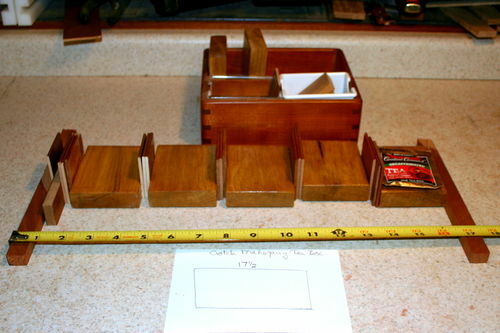 Build a box the right size for teabags. Remove all the strings and metal from a WOODEN Venetian blind. 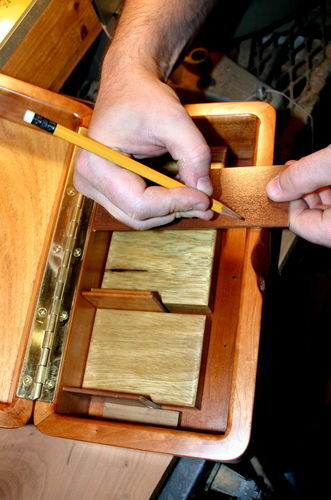 Trim the slats to fit inside the box. Two for the length and several for the width. Use the wooden teabags to space the width pieces. 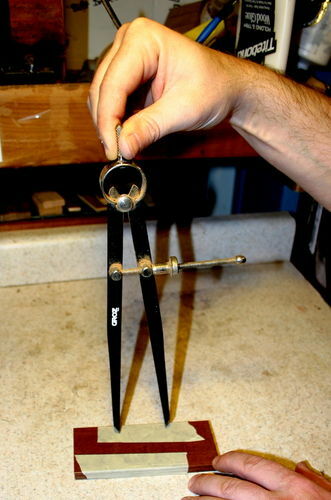 Use a compass to space the length pieces. Cut all the pieces half way through with a 1/8 inch blade. Put some aluminium foil in the bottom of the box. Dry fit the grid inside the box. While the grid is in the box, remove just one piece. 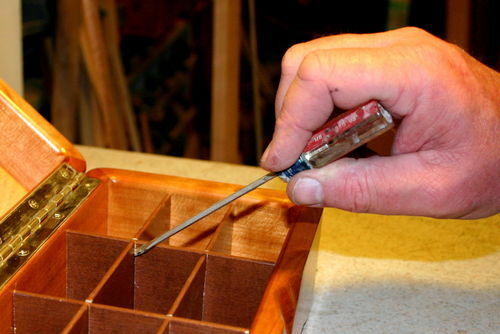 Apply glue with a syringe into the half-lap slot and glue the grid together. Let the glue set while grid is in the box. First you need to make the tea box the right size. This method keeps measurements to a minimum. That means there is far less to go wrong. The key to making this system work is making some teablocks and having some scrap pieces of Venetian blind. 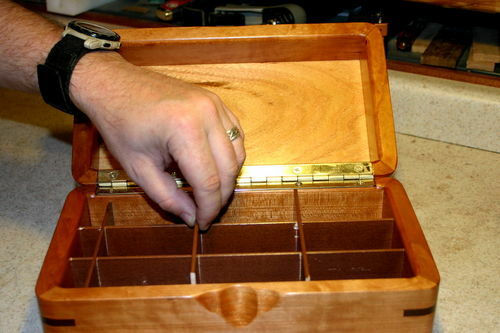 Here I have organized seven blocks and some blind scraps in their own small cherry box. Make 6 or 7 wooden blocks as wide as a teabag and a little taller. I am going to call these ”teablocks” in the rest of this tutorial. You are going to use these for the layout of both your box and your grid work. Here you can see the layout for the box. Before you do anything plane down a board to about 5/8 of an inch. Add the bottom groove for the bottom board of the box. 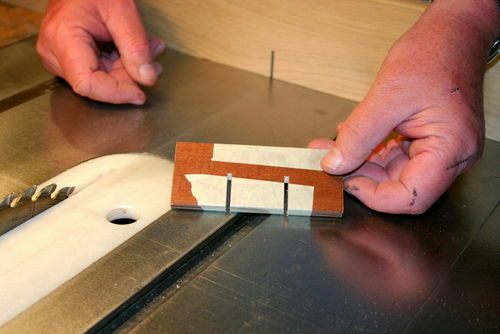 Cut two small slices from the actual board you are going to use and place them on the outside of the layout. Then place some scrap 1/8 inch pieces of Venetian blind between the tea blocks. 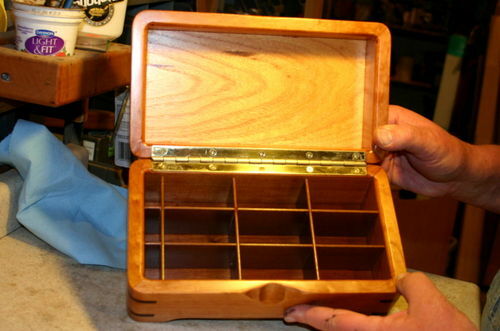 Three of these scrap pieces between gives plenty of room for teabags to slide into the compartments easily. Add a small scrap to use to space out for the chain pocket. You can see that spacing on the left. If you squeeze all these parts together you can measure from end to end and it should give you the exact size for the boards you need to make the front and back of the box. Don’t fight this. If it is close, round up to the nearest 1/4 inch. You can always make your chain pocket a little larger. If you make your tea box too small and the teabags don’t fit…then you have a problem. Round up. You can make the depth of the box any size, but if it is less than 6 inches it tends to get tippy when you open the lid. Too much over 8 inches wide and it is getting to be a really big teabox. We have the the width and depth measurement for our box. So 2 times the width plus 2 times the length makes the length of the board we need. Lets say it is 8 1/2 inches long and 7 inches wide. We would need a board (2×8 1/2 + 2×7=17+14=31) 31 inches long. Add 1 inch for the cross cuts you will make on the board and you now need a board 32 inches long. If your board is slightly less, make your box a bit more narrow. If your board is much too short, start over with the layout and take out one or two teablocks. 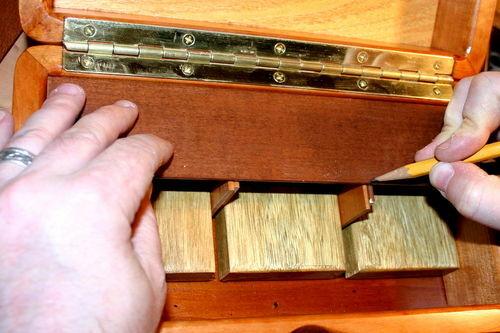 To figure out the height of the box, set a teablock on the top of your groove for the bottom board and measure where you want to put the groove for the top of the box. Remember: You will need some extra room inside the box. The inside front of the hinged box will hang up on the top of the teabags as the lid closes if you don’t have that extra 3/4 of an inch or so of room. When you cut the lid off this box, use a slat plus at least a quarter of an inch to mark a line for your saw cut to slice the top off. So you have a box the right size, how about the lift out dividers? This system makes the dividers into a unit, but the whole unit can be lifted out of the box if the buyer wants to re-purpose the box. Cut away any slots or notches in the blinds so you don’t accidentally put them in your work. Re-assemble the teablocks and spacers inside the box. Make sure your slat is squared. Hold the slat across the inside of the box and mark the end. Fit the slat into the box. Don’t make it so tight that you can’t get the grid work in and out of the box. Here is a short cut. 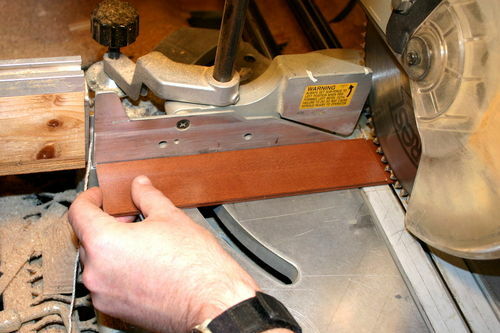 Make the second slat the same size by putting the ends even, laying it on top of the slat you want to cut, and then bumping the top board on the blade of the chop saw while the bottom board slides under. Without removing the top board, cut the bottom board. If you take the top board off, you are going to move something. Okay, we now have the two long slats cut to the correct length. 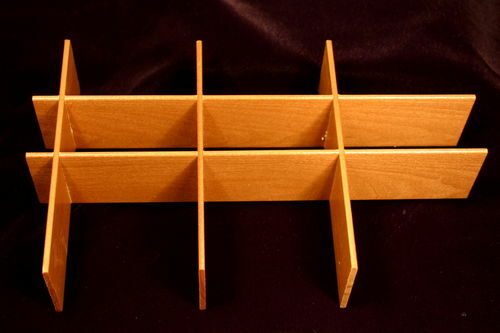 Now, put a small pencil mark on the slat where it crosses the middle of the three spacers between the teablocks. This is to mark where you want the dividers to cross inside the box. Mark and cut the shorter cross pieces to length. Don’t fit them too tightly. Tape your two long pieces together. Tape all of your short pieces together making sure all the ends are even. 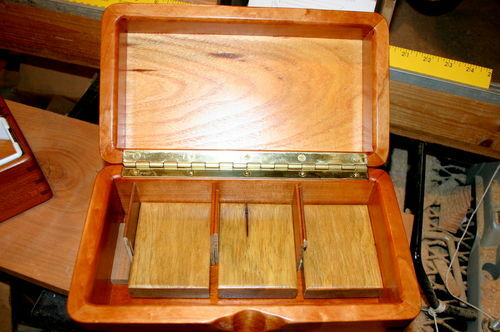 A compass is a quick and easy way to be sure your compartments inside the box are all the same size. On the top slat of your taped up short pieces, just step off three equal steps and adjust the compass until they are equal. When you have it right just bear down on your points and make some small dents that will show you where to cut your half slots. 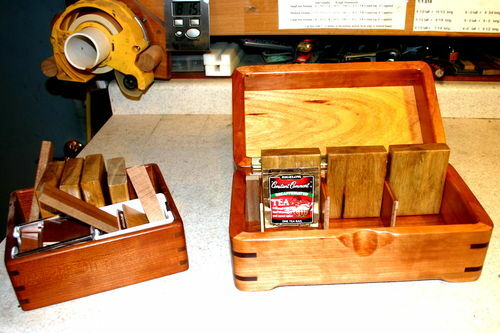 Since I know my slats are 2 inches wide, I keep a small spacer in my teablock kit. The spacer is one inch wide plus a 32nd. 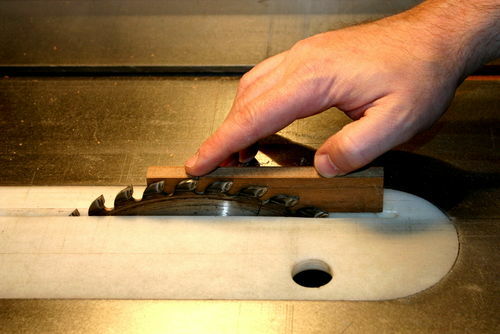 With the saw turned off and unplugged, bring your spacer next to the saw blade and carefully use your fingers to tell you when the top of the spacer is even with the top of the blade. Set your miter fence at 90 degrees to the blade. Being very careful to keep your fingers well away from the blade, cut the slots at your compass indents in the short pieces. Don’t drag the slats back through your blade. Make the cut and lift your work away before you pull it back. With a single pass you will get just the right width and will have a nice tight fit. 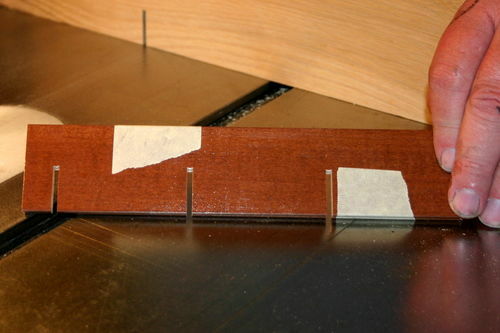 Hint: You want to cut very slightly past the halfway point of your slat width. 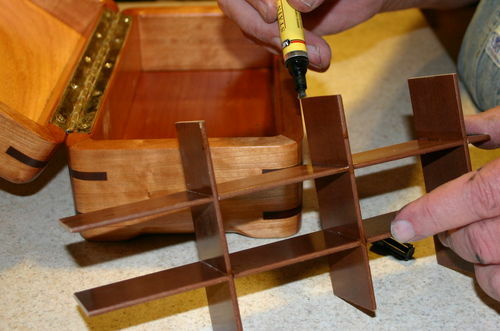 This extra space makes sure your pieces will all fit flat on the bottom of your box and it gives the extra glue a place to go. 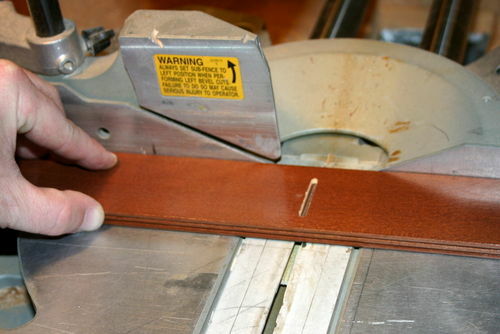 Now use this same technique to make the half lap cuts in your longer slats. This time cutting where you marked the lines using the re-assembled teablocks. I didn’t picture this step, but usually I put a piece of aluminium foil in the bottom of the box to protect the finish from glue squeeze out. The foil doesn’t have to fit tightly around the whole bottom, it only has to be under the places where the slats cross. 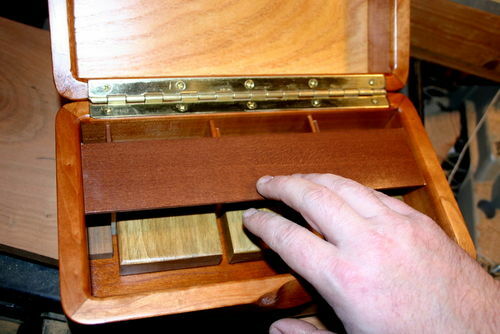 Dry fit your slats inside your box. Make sure they don’t fit too tightly. 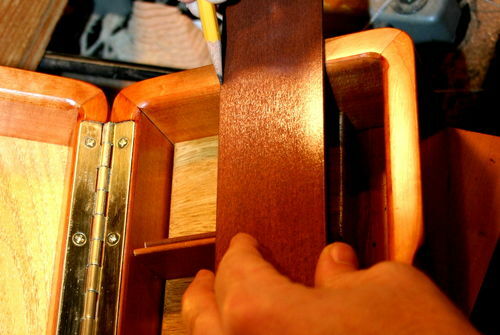 Hint: I find it is easier to first put the long slats inside with the slots facing upward. The I can fit the short slats in quickly since I am just aligning two slots. You can use a glue bottle, but I have found this is a great time to use a glue syringe. 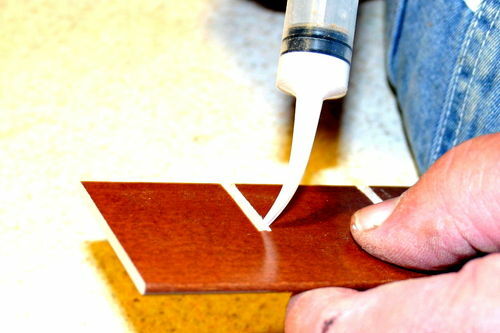 It allows you to put the glue where you want it and not make a complete mess of it. 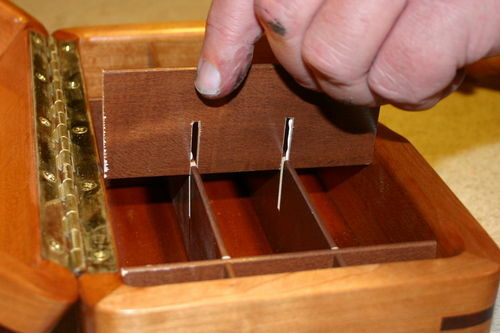 This is another reason to put the short pieces in with the slots down. 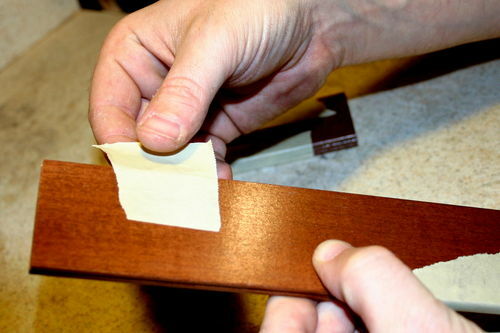 You can remove just one slat from your dry fit and leave the rest of the slats in place while you apply the glue. I use a thick glue so it doesn’t run. Apply just a little glue on both sides of the slot. It really doesn’t take much. When you re-insert the short piece, be sure you push it down all the way so it touches the bottom. 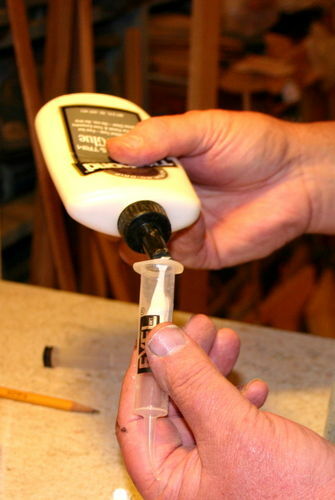 No matter how careful you are, you are going to have some squeeze out with the glue process. I use a small bladed screwdriver and a paper towel to remove the glue. Since slats are prefinished, you are bound to have some slight chip out with your cuts even with the best and sharpest blades. Little things make a difference in your work. The big box store sell furniture markers that are made much like a magic marker or felt tipped pen. They come an an assortment of colors. It is easy to match these to your slat color and just take a minute or two to color any chips. 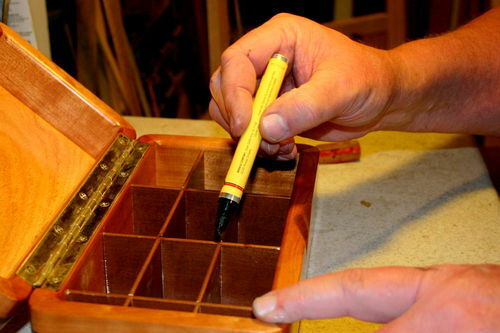 Probably no one will care but me, still I take a little time to color the ends of the slats and apply one quick coat of finish to them when I am working on the next box. Leave the grid work inside the box until the glue sets. That way you can be sure it will fit the box. Ta-Da! 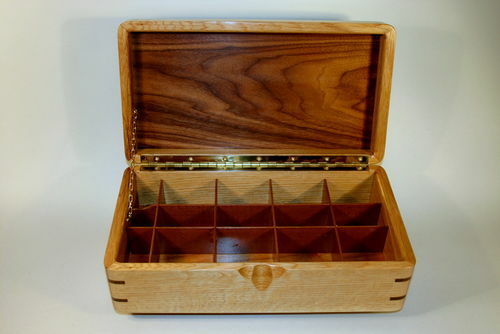 You now have the right sized box and a grid that separates the tea box into several neat compartments. Once it is glued, assembled, and set inside the box it is surprisingly strong and durable though it is made of fragile material. Another gem in a series of gems. Thanks so much Boxguy, your blogs are very helpful, and you are a great contributor on this site. When I first got here you helped me out a lot. Your work is inspiring. Thanks for the tutorial, u are very good at making boxes! I do have one additional comment – when I make my tea boxes, I leave the inserts loose so they can be removed and the box cleaned. 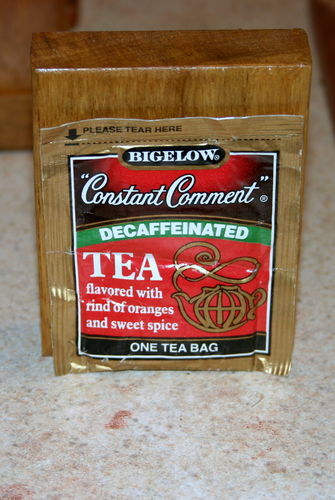 I find that tea has a way of escaping even in those nice packets! The trick is in knowing how to get them back together. Great tutorial… it shall go into my favorites. Thanks for taking the time to share, we all learn something from each post; so keep up the good work. This is helpful information. Thanks for sharing with us. I will save for the next build. great tutorial, a lot of good info. You’re putting those teaching skills to good use! :) This blog took some time to put together. Well done. I’m actually getting to the point where I will be making a box or two soon. Got to do some major maintenance first. will be coming back to use your blogs. Ever consider putting this into a book form? Where do you find the nice WOODEN Venetian blinds? Seams most of the blinds you buy now a days are plastic. Thanks for tutorial. Your effort to put it together is appreciated. I have been wanting to make a display case for my shot glass collection. Your methods would work well for that project. Wood slats would be strong enough. Now to find a blind in the dumpster or something. Might take a few calls to retail installers. Wow, what an amazing blog post! Thanks for this. I have one question, or maybe it’s just a musing. I was thinking that if you didn’t glue the grid into the box, that it could be re-purposed at any given time, but that’s just me :-). Beautiful tutorial Boxguy. What a great write up Big Al, I didn’t make it all the way through but am saving it for later because I know I’m going to need it at some point. I’ve already purchased a set of blinds so I have tons of slats. Right now the men’s valet box design that I’ve been making as become a huge hit and selling like hot cakes no more then I get one made and posted they are sold, I’ve even tried raising the prices to slow sells down just so I can breath but all that’s doing is making my pockets larger LOL and still receiving orders for them, my problem is I don’t want to make it a job, I want to keep it fun and I’ve taken your advise I’m not taking on any more special orders, just what I am currently making. You always do such a great job of teaching! And motivating! I have a box laid out, but have been too sick to feel safe on the saw. Just reading your blog post made me feel better. Thanks Brother. Big Al I failed to mention in my comment above, I owe it all to (mainly) you among others here on LJ for my success, once again thank you for sharing your great tutorial.